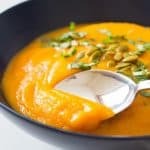 This healthy roasted Butternut Squash and Carrot Soup is perfect cold weather food and is super easy to make. 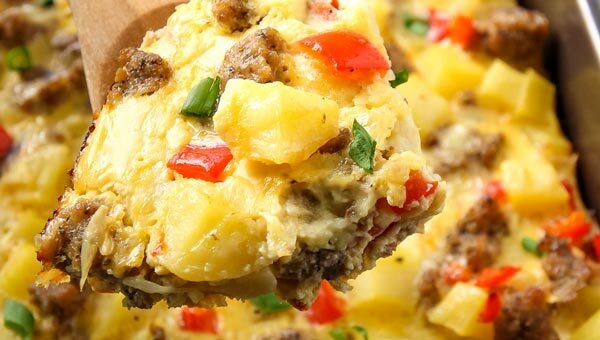 The recipe is vegan, gluten free, clean eating and can also be paleo or Whole30. Round out the meal with your protein of choice – I like cooked quinoa. Thank you to Mann’s for sponsoring this post. Thanks their ready-to-use Butternut Squash Cubes prep time is minimal and you can get cooking and eating sooner! When it’s cold out there is nothing better than warming up from the inside out with a hot bowl of comfort food. 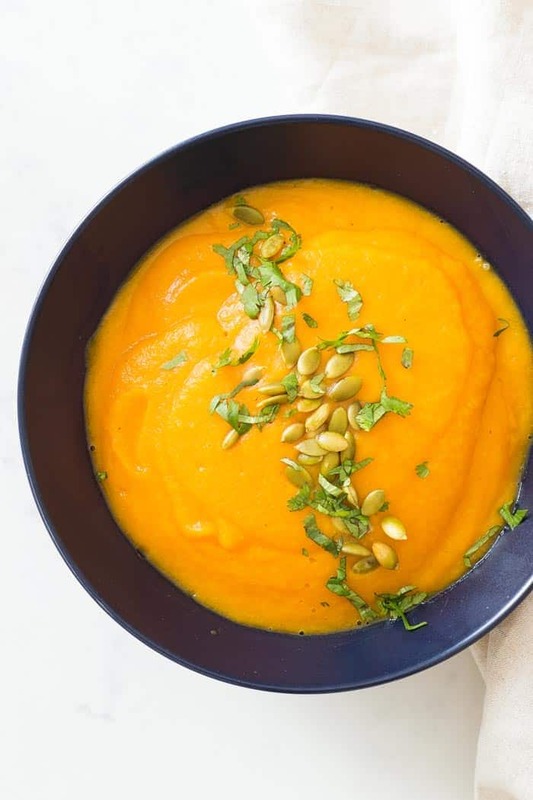 This Butternut Squash and Carrot Soup fits the bill perfectly. It is healthy, nourishing and comforting, easy and fairly quick to make. There is minimal hands-on prep time, you can even make it in a blender, and it is easily adjustable to dietary needs and taste preferences. Although you could just roast 2 butternut squash halves, there is so much more amazing flavor when you roast it in cubes. Because of the increased surface area you’ll get more ‘roasted’ flavor. And opening a bag of Mann’s butternut squash cubes is even faster than halving a squash and scooping out seeds. Despite what the image shows, I actually rarely bother with peeling carrots when they end up being blended anyway. This again shaves times of your prep. Just give the carrots a good wash and maybe a quick scrub with a vegetable brush. Leaving the peel around the garlic cloves keeps them from burning. Leaving the root ends of the onion quarters keeps the layers from separating and burning. 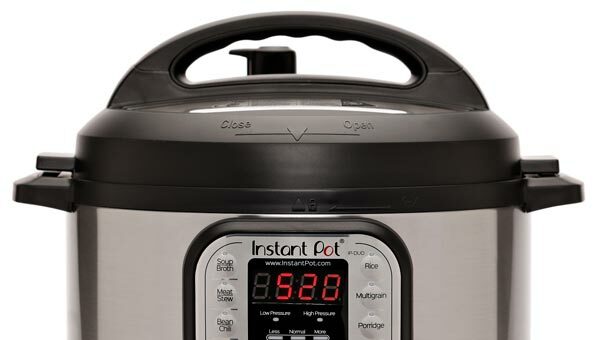 With a high-speed blender like the Vitamix, the soup ingredients can go straight from the oven to the blender. Even without preheated broth, 5-7 minutes in the blender can produce a steaming hot and super creamy Vitamix butternut squash soup. But this simple butternut squash soup is just as easily made on the stovetop with an immersion blender. I’ve kept the seasoning of this recipe quite simple. Salt & pepper, broth, paprika, cumin and cayenne to taste if you want to make it a spicy butternut squash soup. But of course you can play around with other spices to create quite a different flavor profile. Ginger is a popular combination with butternut squash. Try roasting an inch or so of ginger root together with the other veggies, then peel and blend for a butternut squash carrot ginger soup. Curried butternut squash soup is another favorite version. Just use some curry powder seasoning to taste. Or turn it into a Thai butternut squash soup with coconut milk and Thai curry paste. 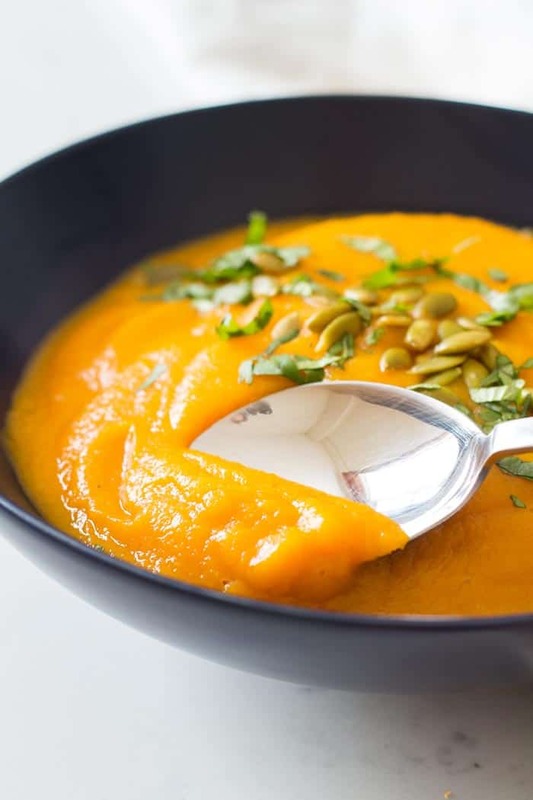 You can serve this vegan butternut squash soup just as it is as a light pre-dinner soup. But if you want to make it a rounded out full meal, you’ll definitely want to add some protein. One way to do that is with the classic soup and sandwich combo. Another delicious option is quinoa. I find that about 1/2 cup of cooked quinoa is a great way to give the cream butternut squash soup more substance and make it a more filling meal. It’s also a great way to add vegan/vegetarian protein. To make this a Whole30 or paleo butternut squash soup, use something like diced or shredded chicken (omit maple syrup for Whole30). Although this is a recipe without coconut milk, if I have an already open can, I like to add just a little splash of coconut milk on top of each bowl to swirl in. as would some crumbled bacon bits. For herbs I love chopped cilantro. Absolutely! Cream soups are perfect for freezing. Because all of the ingredients are already blended up, you don’t have to worry about the freezing process changing or creating any weird textures. Here is how I freeze soups. I am a little apprehensive about freezing in glass jars – cleaning broken glass out of my freezer sounds like my worst nightmare. So I actually repurpose quart-sized yogurt containers. But first, I let the soup cool down to room temperature. With hot soup there would be the whole issue of plastic components leaching into the food. I fill the container only to about 1-inch from the top to allow for expansion once frozen. Then I close the containers tightly and transfer to the freezer. This butternut squash soup can be stored frozen for about 2-3 months. Once ready to use I pull the containers from the freezer and let the soup thaw in the fridge (if I plan ahead) before reheating. If I didn’t think ahead, I just plop the entire soup block from the container into a saucepan and let it thaw and reheat slowly on very low heat. Don’t reheat inside the plastic container! I use my Vitamix blender if I am making the soup straight from the oven. For the stovetop method I heat all ingredients in my Dutch Oven and then puree them with an immersion blender. 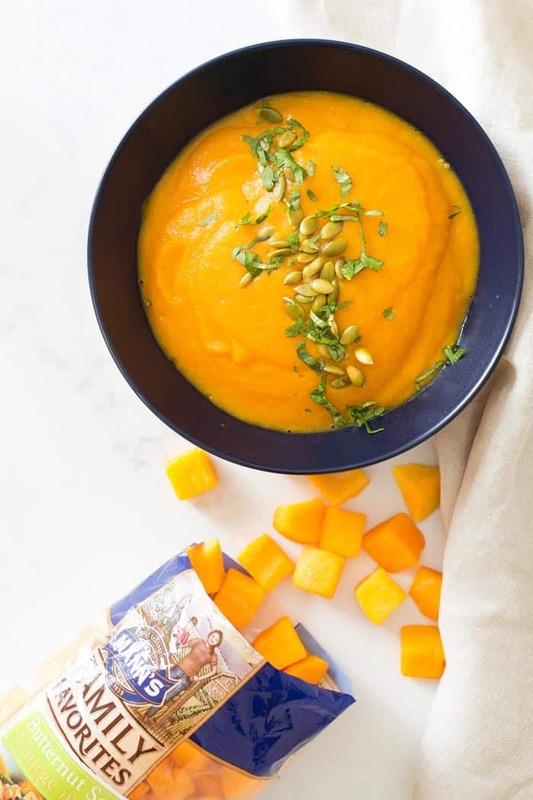 This healthy roasted Butternut Squash and Carrot Soup is perfect cold weather food and is super easy to make. 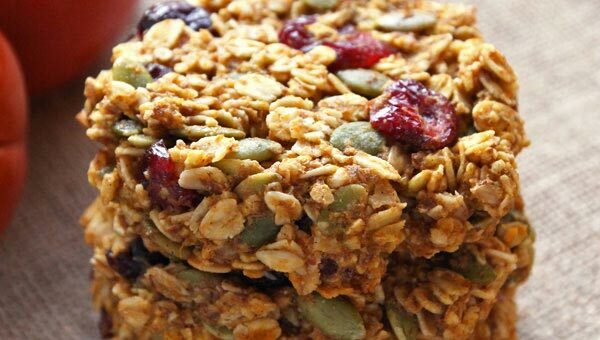 The recipe is vegan, gluten free, clean eating and can also be paleo or Whole30. Preheat your oven to 400°F. Prepare 2 baking sheets. Place the butternut squash cubes on one baking sheets. On the other one arrange the carrot pieces, quartered onion (leave the root part intact), and garlic cloves in skin. Drizzle everything with the oil and generously season with salt and pepper. Place both baking sheets in the oven at the same time and roast veggies for 25-30 minutes until tender. Flip once after 15 minutes. Add broth, maple syrup, paprika, cumin and cayenne to the blender jar. Add the roasted vegetables (remove root end of onion and garlic peel). Blend on high speed until super smooth and steamy (~ 5 minutes). Add the broth to a large pot. Add paprika, cumin, cayenne and the roasted vegetables and bring everything to a boil. Using an immersion blender puree the soup until completely smooth. Serve each bowl of soup with about 1/2 cup cooked quinoa for added protein. 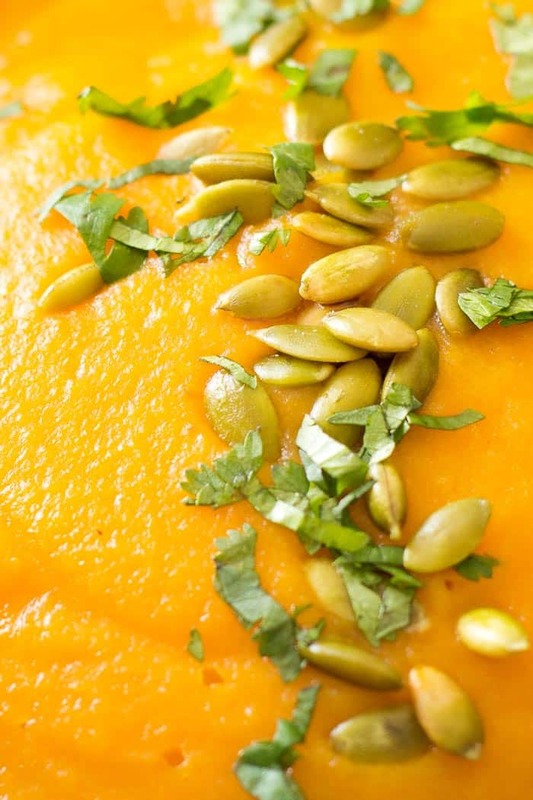 Top with roasted pumpkin seeds and cilantro leaves. Optionally, drizzle with a little coconut milk or olive oil. Nutrition data includes 1/2 cup of quinoa per serving. « Did You Know Shoe Stores Once Used X-ray Machines? This is delicious!! I added 1/2 the maple syrup and it was just the right amount of sweetness for us. We don’t have Mann’s here in France, so had to use a whole, fresh butternut. Pre-cut veggies are my idea of great fast food! This was SO delicious!! I actually took out the maple syrup bc we like things spicy/less sweet and it was amazing. Super easy too! Totally works without maple too. So glad you enjoyed it! Such a pretty soup, Regina! 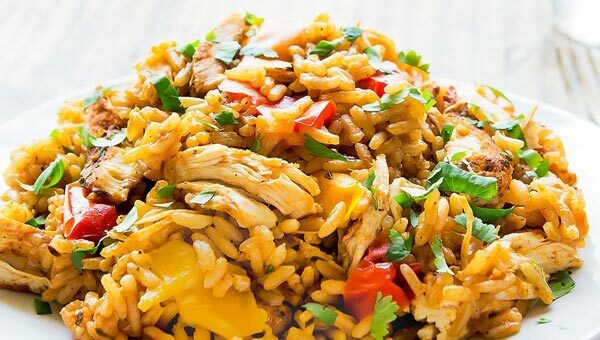 Love how you’ve shortened the prep time to make it an easy meal any night of the week! How many servings does this make? Looks so good. I am glad you like it, Jillian! I love an easy and healthy meal! I have to try this one! 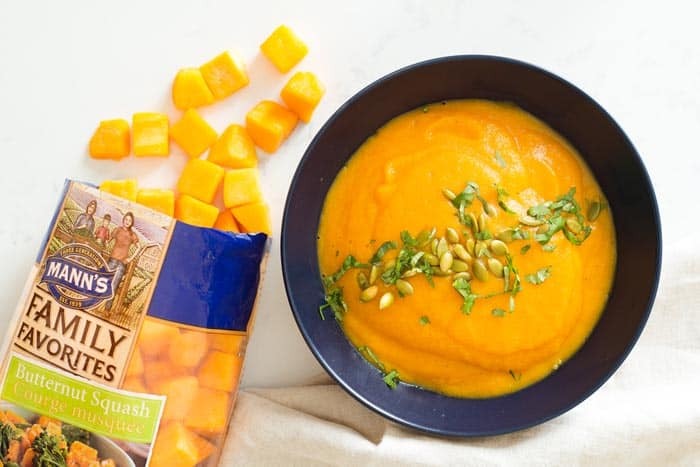 We love butternut squash and your soup looks amazing! Cannot wait to try it out! Had no idea you could buy butternut squash cubes like that in a bag! Looking for them next time at the store! Isn’t that awesome? 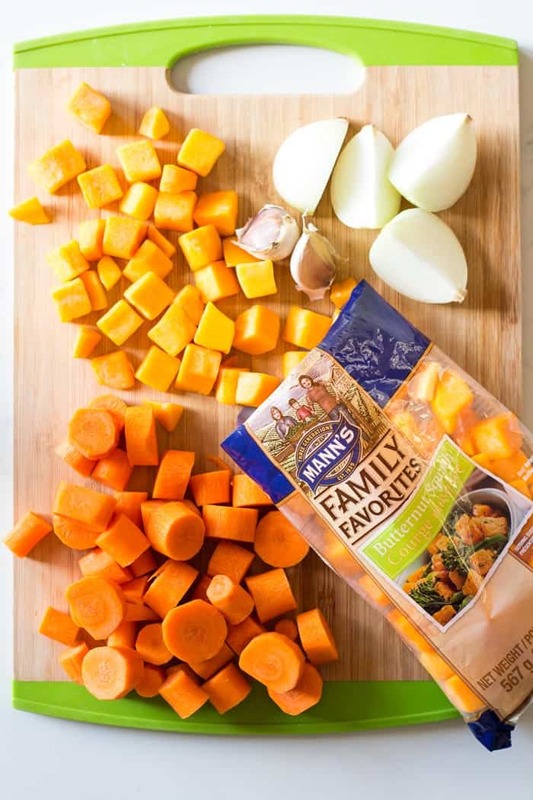 Mann’s makes it really super easy to incorporate more veggies in our diet.